The router has long been recognised as an excellent device for cutting arcs and circles in wood, MDF, plastics etc. but most of the attention has been devoted to cutting largish circles, such as for table tops, bread boards, etc. with a trammel bar, compass arm, or similar device. The problem with these is that the minimum diameter of circle that can be cut is determined by the dimensions of the router base. It is perfectly possible, however, to cut very small circles with the router. The trick is to position the pivot point underneath the base of the router and slide it as close to the cutter as required. 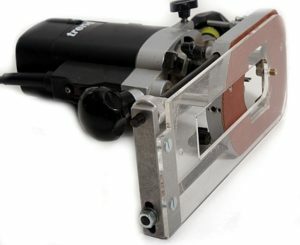 It is not difficult to make your own simple small-circle cutter but many workers prefer to buy a commercial version and get straight on with their project. 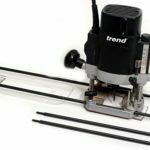 A versatile circle cutter, which can cut circles and arcs of diameters ranging from 25mm to 200mm, is available from Trend. 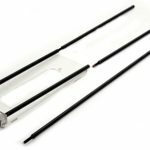 It is called the N-COMPASS and consists of a base plate of 4mm thick clear plastic mounted on an aluminium bridge piece, which carries two 8mm diameter rods. These rods slot through the router’s fence-rod holes and are infinitely adjustable over their length. Two countersunk holes in the base plate provide alternative fixing positions for a 1/4in diameter screw, which acts as the pivot point for the router. The position furthest from the bridge piece gives the smallest radii. One of the guide rods is laterally adjustable to cater for different router fence-rod spacing; the other is fixed but with a micro adjuster for precise setting of radii. A slot down the middle of the base plate allows the cutter to be plunged through. A final detail is that the gap between the base plate and the rods can be adjusted by means of shim pieces to cater for different routers. The N-COMPASS fits direct to the Trend T5 and the many other routers that have 8mm fence rods with spacings of 75 – 94mm between centres. Among these are the Black & Decker range, the Elu 96, Trend T3 and T4, De Walt DW 613, 615, and 621 and many of the Far Eastern copies of these mainstream routers. Fit the pivot pin to the hole nearest the bridge piece, insert a cutter in the router – a narrow straight of 1/4in diameter will suit most applications – and slide the guide rods into the router fence-rod positions. 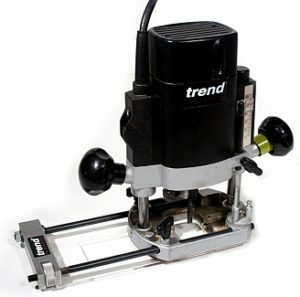 Plunge the cutter through the slot in the base plate and stand the router upside down on the bench – this is one of the many occasions where a router that can be stood upside down makes life easier. Slide the N-COMPASS to give the required radius of the circle or curve. Tighten the router thumbscrews and use the micro adjuster to set the precise radius. 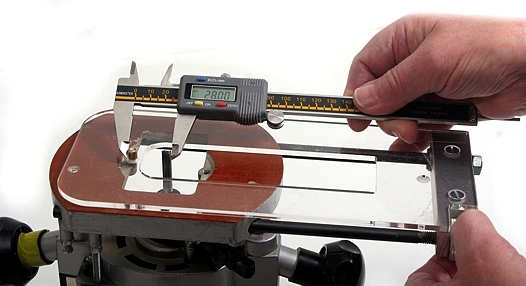 The best measuring tool to achieve accurate radii is the digital calliper gauge. They are very reasonably priced these days and one of them is among my most frequently used tools in the workshop. (I use the metric scale; most jobs are not critical to a fraction of a millimetre). The cutter blades must be set in the ‘East-West’ direction i.e. the blade should be facing the pivot pin. The centre of the circle is located at the centre of the pivot pin. With a pivot pin of 1/4in you can add or subtract 1/8in (3mm approx) from the required radius and work from the inner or outer edge of the pin. Depending on whether it is a hole or a disc that you are cutting, set the radius to the nearer or further cutter blade. Now drill a 1/4in hole at least 1/4in deep at the centre of your intended circle, and set the workpiece on a sacrificial board or cutting table since you are going to cut right through it. Clamp the workpiece if it is big enough to position the clamps without fouling the path of the router. Alternatively, hold it with double-sided tape or on a router mat. Where possible, place a small piece of double-sided tape under the centre to prevent it coming loose on the final pass and possibly spoiling the cut. Make the cut in a series of light passes in an anti-clockwise direction. Start at the ‘6 o’clock’ position, cut right round and continue to the ‘5 o’clock’ position, release the plunge, switch off, and start again from the ‘6 o’clock’ position. This way you will be sure of completing the circle on each pass. Halfway round the cut change hands to complete the rotation. This might sound a bit hairy, but in fact is easy if your router has a switch that doesn’t need holding ‘ON’. If yours hasn’t you have to give yourself enough space to walk round the workpiece. It also helps if you hang your power cable and extractor hose from the ceiling. The above system requires a hole drilled in the workpiece to act as the pivot hole. If a hole in the workpiece is unacceptable, you can drill a small piece of Perspex, tape this to the workpiece at the centre of the circle, and drop the pivot pin in it. To stabilise the router base it is also a good idea to tape a piece of the same thickness Perspex to the outer edge of the N-COMPASS base plate. 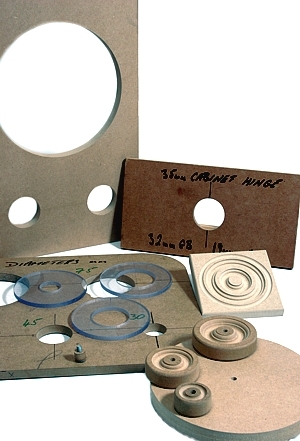 The ability to cut very small circles opens up numerous possibilities. These include wheels, loudspeaker and clock face openings, rosettes for furniture and fire surrounds, circular tile settings, dust extractor connections, numerous jigs and workaids etc. 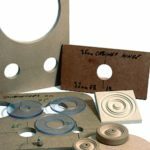 The standard N-COMPPASS allows circles with diameters between 25mm and 200mm to be cut, but much larger circles are possible with the addition of extension rods. These are available as an accessory in packs of four, and screw to the guide rails on the base plate. One or two extension rods can be added to each of the standard guide rails, allowing circles of up to 740mm radius to be cut with the pivot pin at the bridge-piece end of the base plate. This can be further extended by adding additional extension rods but beyond a certain point the jig becomes unstable and the quality of the cut begins to suffer. If you are going to cut larger circles you are strongly advised to practise by starting with smaller circles in scrap wood and working up to the larger diameters. The Trend N-COMPASS allows a wide range of circles and curves to be cut with many of the 1/4in routers on the market, opening up a whole new range of possibilities. I regard the ability to cut small circles to be an essential part of the router user’s armoury.